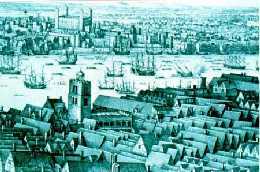 During Elizabethan times the game still maintained a huge level of support and participat ion despite the numerous laws passed to ban the game. In fact football found one very prominent supporter in Richard Mulcaster, headmaster of the famous Merchant Taylor’s school and St. Paul’s. He publicly declared that football had many educational benefits as well as improving health and strength. In his view the game just needed a little reorganisation such as a limited number of players and a referee. …the Footeball play, which could not possibly have growne to this greatnes, that it is now at, nor have bene so much used, as it is in all places, if it had not had great helpes, both to health and strength, and to me the abuse of it is a sufficient argument, that it hath a right use: which being revoked to his primative will both helpe, strength, and comfort nature: though as it is now commonly used, with thronging of a rude multitude, with bursting of shinnes, & breaking of legges. it be neither civil, neither worthy the name of any traine to health. Wherin any man may evidently see the use of the trayning maister. For if one stand by, which can judge of the play, and is judge over the parties, & hath authoritie to commande in the place, all those inconveniences have bene, I know, & wilbe I am sure very lightly redressed, nay they will never entermedle in the matter, neither shall there be complaint, where ther is no cause. Football historians have referred to Richard Mulcaster as “the greatest sixteenth Century advocate of football” which can be considered quite fair in a time when playing football could lead to imprisonment.